First of all, we wanted to wish you guys a Happy New Year. As we look back at the year of 2012, it was full of success and joy for the WPBeginner team. It was also a great year for the WordPress community in general. Over the course of the year, we wrote tons of tutorials, so we thought we should compile a list of our favorite ones. Let’s do a year in review of WPBeginner. How to Split WordPress posts into Multiple Pages – When writing long posts, you have a few options. You can leave it really long and make the user read it all on one page. You can divide the topic into a post series. Or you can even split the posts into multiple pages. The tutorial above shows you how to do that. How to Increase Pageviews and Reduce Bounce Rate – When starting out, most bloggers believe that getting people to your blog is hard. Whereas the hard part is getting users to stay on your site. Most users come to your site and end up leaving without even going to the second page. When a user leaves without even going to the second page, it increases your bounce rate. It also decreases your pageviews per visit. On a bigger picture, it decreases your ad revenue. This article will help you improve both your pageviews and bounce rate. How to Create a Donate Form for Nonprofit organization using WordPress – Easy to follow tutorial that shows you how to create a donate form for non-profit organizations with multiple donation amounts (one-time and recurring). How to Create a Photo Album Gallery in WordPress without a Plugin – Intermediate level tutorial that shows you how to create galleries and organize them by albums in WordPress. How to Prevent Youtube from Overriding Your Content – Have you ever been to a site where you notice that media elements such as youtube videos override other content? This can happen if you have drop down menus, floating bars, lightbox popup etc. This tutorial shows you how to prevent that issue on your site. How to Sort Posts by Post Expiration Date in WordPress – A simple tutorial that shows you how to sort posts by an expiration date. How to fix Error Establishing Database Connection issue in WordPress – Possible fixes for one of the most popular WordPress errors. How to Improve Your Editorial Workflow in WordPress – Edit Flow plugin for WordPress is one of the best ways to have a good editorial workflow. What, Why, and How-To’s of Pingbacks and Trackbacks – A complete explanation of Pingbacks and Trackbacks. It also shows you how to disable them on new and existing posts. Why WordPress plugins should not have SEO options – Most WordPress themes only add this feature as a marketing scheme. It actually hurts their users and the community in the long run because it restricts you to their platform. Should you ever change your theme, it is not that hard. We hope that in 2013, more companies would follow WooThemes and start switching to the model we recommend in this post. Beginners Guide to Preventing Blog Content Scraping in WordPress – You can never entirely keep anyone from stealing your content. However, here are some useful tips that will help you prevent a lot of content scrapers. How to Add Odd/Even Post Class in WordPress Themes – Simple yet handy snippet for theme designers. 6 Reasons Why We Switched Away from Livefyre – This was one of the most asked questions by our users when switched. This has raised a lot of debate. We would love to hear your thoughts on this matter. How to Get Google’s Verified Authorship in WordPress – Want to increase your search engine click through rate? Add authorship to your site. How to Password Protect Your WordPresss WP-Admin Directory – This is a very handy security tip that most popular sites use. How to Set Minimum Comment Length in WordPress – This prevents those one word spammy comments. How to Boost Email Newsletter Signups in WordPress – We use this plugin to add the little opt-in box in our comments. It doesn’t add a drastic number of users, but it is just another way to gradually build your email list. How to Install and Setup WordPress CDN using MaxCDN – CDNs improve your site speed. See this article to see how you can speed up your site. How to Switch Between Users in WordPress – Great plugin when developing websites. It helps you test different user roles and permission levels. 5 Reasons Why we use Sucuri – To improve our WordPress security, we decided to use Sucuri. They are the best in the industry. Categories vs. Tags – SEO Best Practices – A comprehensive guide that helps you better understand both categories and tags. Find out which is better for SEO. How to Allow Post Previews of Unpublished Posts – Normally only users with access can see your unpublished posts. What if you are doing a paid review for a sponsor? You can show them your unpublished content without creating a user account for them using this plugin. How to Fix the White Screen of Death in WordPress – A fairly common error in WordPress. Here are some possible solutions. How Many Plugins Should you Install in WordPress? – A post answering one of the most asked questions. How many plugins can/should I install? Does plugin quantity slow down my website. How to Add Twitter Cards in WordPress – Twitter recently introduce twitter cards that adds rich media below every tweet. Learn more about twitter cards and take advantage of this on your WordPress site. How to Effectively Attract and Manage Guest Bloggers in WordPress – Here is how you can manage guest bloggers in WordPress. How to Create a Sticky Floating Footer Bar in WordPress – How to add the floating footer bar on your WordPress site like the one on this site. How to Create a Daily and Weekly Email Newsletter in WordPress – Our users often ask us how to provide daily and weekly newsletters like we do. This article will show you how to do it. What is a WordPress Theme Framework? – An easy to understand tutorial that explains what is a WordPress theme framework. What are the advantages and disadvantages of using a WordPress theme framework, and more. What to Do When you are locked of your WordPress Admin – If you are locked out of your WordPress admin, then this article will help. How to Add Tooltip Testimonials in WordPress – A neat way of adding testimonials on your site. WordPress Body Class 101 – This is a must see article for new designers. Body class is a powerful tool that can help you customize your site without using a lot of complex PHP. How to Find a Backdoor in WordPress and Fix it – If your WordPress site is hacked, then make sure you scan it for a backdoor. Otherwise, you will be hacked again. How to Automatically Tag your Posts – Tagging posts can take some time. This plugin allows you to automatically tag your posts and save time. How to Credit Multiple Authors (co-authors) in WordPress – This plugin helps you properly credit each author. How to Efficiently Manage Post Series in WordPress – Post series are a great way to keep users engaged. This article shows you how to properly manage them. These were the best WordPress tutorials of WPBeginner in 2012. We hope that you liked them. We want to thank you for supporting us by sharing our articles, giving us feedback, and suggesting new topics. We cannot do anything without our community. 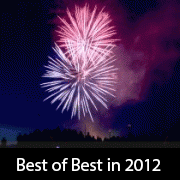 We hope to add more useful tutorials in 2013.
great collection, I hope to add more useful tutorials in 2013.